The question may seem elementary; “how do you replace a cabinet door?” The process may not be as simple as one might think. I’ve been remodeling kitchen cabinets for over thirty years. There are certain hinges that can cause difficulty and door styles that may not be available. A popular problem people who have laminate cupboards run into is locating discontinued cabinet laminate. There are other snags too, like not being able to match the exact wood or thermofoil cabinet doors design that you have. Of all the cabinetry door styles and types out there, real wood doors are going to be the easiest to replicate when you can’t find a matching design on the market. Some styles that are close but not exact will almost always go unnoticed. Only the trained eye of a kitchen cabinet professional or interior designer may spot the difference. Finding the replacement kitchen or bathroom cabinet door-If you do not know where your cupboard doors came from, start by having a local cabinet professional examine a door. On many occasions I’ve been able to identify the manufacture of a damaged door instantly. Another possibility is to contact the general contractor who built the home. If it was not too long ago, they will have the records readily available. If you have MDF doors, read this articles on Replacing Thermofoil Cabinet Doors. Many fabricators place a post-it label on the back of their products. They generally get removed from the doors, but oftentimes can be found on the back of a drawer face. These labels may have the company name on them and the code which will identify the door design and color. Fixing the cause of the door needing to be replaced-If there were broken hinges that created this problem, take one of them to a local cabinet supply company and see if they have an exact replacement. If you need to do kitchen cabinet repair, fix whatever the problem is. Things like blown out particleboard cabinet parts can be repaired with a strong wood filler. You may need to drill holes for European cabinet door hinges – Mark the replacement cabinet door where the hinges need to be installed with a pencil. Take it to a kitchen cupboard shop and have them drill the holes for you. You should take an existing door with you that is already drilled. This way the worker can set the drill-press to the correct specifications for your hinge style. Some cabinet door hinges require grooves to be cut into the edges and the backside. This can be done with a table saw or you can hire someone to do the work for you. If you elect to try this yourself, it is just a process of trial and error setting up the equipment to make the proper depth cuts. How to Adjust Cabinet Hinges –There are several styles of cupboard hinges. 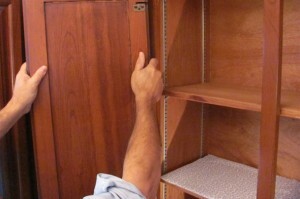 You can usually adjust concealed cabinet hinges in three stages. This process is done with a Phillips screwdriver. Adjusting cabinet hinges that have springs is a little more difficult than working with the Euro style. You may have to drill a new pilot hole for the final set screw to be inserted into. If you want to save yourself money, do as much leg work as possible before contacting a professional installer to replace your kitchen or bathroom cabinet door. Experts in this business get paid top wages. Even though you may think your project is small, overhead costs for cabinet companies are not. Most companies who supply replacement cabinet doors provide a made to measure service so with all the helpful tips you’ve supplied here, most people should be able to easily transform their kitchens or bedrooms.